The square in front of the building is known as Opernplatz (Opera Square). The Alte Oper is located in the inner city district, Innenstadt, within the banking district Bankenviertel. The Oper Frankfurt now plays in the Opern- und Schauspielhaus Frankfurt, completed in 1951, which it shares with the Schauspiel Frankfurt theatre company. A citizen's initiative campaigned for reconstruction funds after 1953 and collected 15 million DM. It ended costing c. DM160, and the building was reopened on August 28, 1981, to the sounds of Gustav Mahler's Symphony No. 8, the "Symphony of a Thousand". A live recording of that concert conducted by Michael Gielen is available on CD. The eastern facade of Frankfurt's Alte Oper in September 2014. Shown in black and white to emphasize detail. ^ "Chronik und Historie". www.alteoper.de (in German). Alte Oper Frankfurt Konzert- und Kongresszentrum GmbH. 21 December 2009. Retrieved 5 February 2014. ^ Helmensdorfer, Erich (1982). Frankfurt - Metropole am Main: Geschichte und Zukunft (in German). Düsseldorf, Vienna: Econ-Verlag. p. 234. ISBN 978-3-430-14261-8. Groß, Lothar (2012). Made in Germany: Deutschlands Wirtschaftsgeschichte von der Industralisierung bis heute Band 1: 1800 - 1945. Books on demand. ISBN 978-3-8482-1042-8. 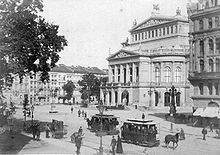 Wikimedia Commons has media related to Alte Oper. This page was last edited on 17 April 2019, at 13:45 (UTC).